We will be exploring and “on safari” in 4 different wildlife areas in Kenya, stays at 2 tented camps & 2 lodges, including an amazing 4 nights in the Masai Mara during the sensational yearly wildebeest migration! You will also have the opportunity to experience various cultural activities including a stop at the equator, and visiting a traditional Masai village. 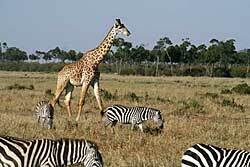 CLICK HERE for the Detailed Safari Itinerary and contact us to reserve your space.